Reserva Natural Volcan Mombacho, a diverse cloud forrest on top of an impressive volcano just south of Granada. There is a good chance that you will see, or at least hear, the howler monkey. On the way to reserve you will see two canopy tours with zip lines. It is great fun to zip from one tree to another. Refugio de Vida Silvestre la Flor, a beach in the south west of Nicaragua, 25 km south of San Juan del Sur, where sea turtles come to lay their eggs. You could make a combination with a visit to the nearby beautiful beach of Playa El Coco and spend the night there. Reserva Natural Chocoyero - El Brujo, a dry forrest in a vally about 21 km south of Managua, that gives a home to a large population of parakeets, called chocoyos, amongst many other species of animals. Reserva Silvestre Privada Domitila, a private reserve with an eco lodge, just south of Nandaime. Only 4WD vehicles are allowed to go up the Mombacho volcano (see also). The other locations you can try to reach in a sedan, but this is not recommendable, especially in the rainy season (see Why four wheel drive). We can take you to the above places and many more in our 4x4's. However, before we bring you to La Flor we always check if turtles have been spotted. And of course you should not forget to visit the colonial city of Granada, at the shore of the largest lake in Central America. You can find a lot of information about Granada (please remember that in Spain there is also a city with the same name) on the internet, for instance in Wikipedia. 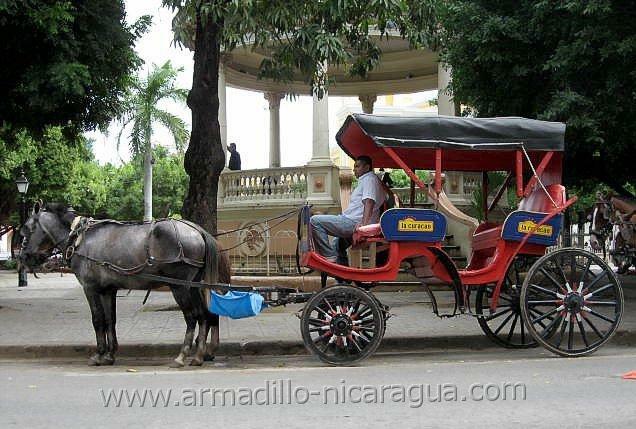 With great pleasure we show you our city using one of our vehiculos. But it could be that you prefer a horse driven carriage and we would understand that.